When it comes to music, history, business or all of three, I like background and details - LOTS of details. I love to learn the stories behind songs. As an observer of people and what makes them tick, I especially relish details about what makes artists what they are and what motivates them. Martin Popoff’s Black Sabbath: Doom Let Loose is one of those books who chronicles – in incredible detail – the history of the iconic heavy metal band, Black Sabbath. Not only is the warts and all telling of the band’s history, it provides great insight into the band’s legendary work. Popoff had the extraordinary benefit of having a decade’s worth of one-on-one chats with Ozzy Osbourne, Geezer Butler, Bill Ward and, of course, Tony Iommi, providing incredible and intimate insights into the band and it’s evolving frames of mind over it’s 37 year history (I know! Hard to believe that they’ve been around that long!). Oh, and many of the “post-Ozzy” band line up were interviewed, as well. Folks like Tony Martin, Ian Gillan, Vinny Appice, and the late Ronnie James Dio are among those Martin Popoff chatted with to make this book what it is. Sabbath fans will not be at all surprised to learn that classics like War Pigs, Iron Man, and Paranoid were heavily influenced by depression, drinking, drugs and an impending sense of doom. Oh, of course there’s the “dabbling” into the dark realm of the occult. As to that last subject, the book provides stories from the guys involving, if true, some downright creepy happenings that you’ll only want to read about in broad daylight. Be warned: If you read those stories at night just before you go to sleep, don’t blame me if you wet the bed. I’m just sayin’ . . . The book is chock full of incredible photos – some never having been published before. There are not only photos of the band over the years but also of some very cool memorabilia. 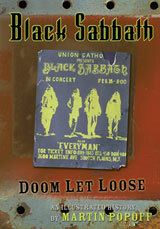 One of my personal favorites is of a poster of a concert in Syracuse, New York, where Black Sabbath opened for the group Mountain (page 51). There are shots of old 8-track tapes and all sorts of other treasures. Whether you’re a Black Sabbath fan or just have an appreciation for icon figures in classic rock music, you’ll want to add Black Sabbath: Doom Let Loose to your personal library.